Group Colors/Livery: Most wear a blue sash around their head, arm, or waist. While some believe the placement of the sash denotes rank, this is not the case. Goals: Serve as the land's premiere bodyguard service for all who seek protection. Leader's Goals: Byron Smith seeks to make enough money to retire and live like a king for the rest of his days. Objectives and Objections: SPS seeks to become the most trusted name in protection. They actively oppose most thieves guilds and often work in concert with local authorities to ensure the security of their clients and cargo. History and Motivation: Byron Smith, as a young soldier back from war, first caught the local communities attention after successfully foiling the attempted assassination of a wealthy merchant's son at the Flying Goose Tavern. For this act of bravery the merchant pulled strings with local nobility and had Byron awarded a small tract of land and some men under his charge. The merchant sang Byron's praises and soon other small merchants asked him to help oversee their caravan to a neighboring town. The caravan was attacked twice by bandits but arrived at its destination with all goods and men intact. 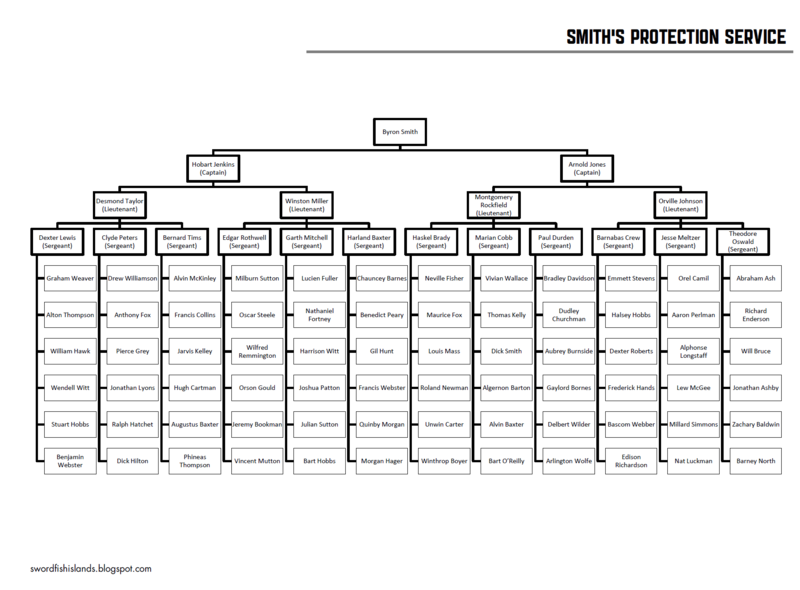 Word spread quickly and Smith's Protection Service was born. Byron believes deeply in protecting others and encouraging trade. He requires all his men to provide their services at the most affordable price possible going so far as to work out barter based deals with lesser merchants and struggling individuals in need. Organization: At the head of the organization, Byron discusses and bids on contracts for protection. He sends missives to his guards via couriers, young men and women who wish to be "Bashers" as well. Each guard has a silver ring set with lapis that they must present to the courier to receive their missives. Chain of Command: Bryon Smith is the head of SPS. His son William is his advisor and handles the financial side of his guild. Overseeing the Daily operations are Captain Hobart Jenkins (Byron's long time friend) and Captain Arnold Jones (whom Byron met just before he left the war). Hobart and Arnold both have two have lieutenants under their command. Each lieutenant commands three sergeants and each sergeant oversees a group of six recruits. (For full names and a visual breakdown of the chain of command see page 3). Methods and Activities: With close to 80 recruits and deep ties with the merchant community, The Bashers attract only the most capable men and women of the community to their ranks. Many seek out SPS for a decent wage and hope to use the connections and recommendations they earn to one day join the King's Guard. In addition to serving as elite body guards, SPS has gained much respect due to their unflagging assistance during any crisis (fire, flood, raid, etc). Resources and Power: The Bashers have a good reputation with the local church. As such, the church will provide bandages, salves, and healing to its members for no additional charge (Byron regularly donates a generous sum to the church thus strengthening ties.) While thieves are of little use to SPS, bard are always welcome, as their songs and stories keep both guards and merchants entertained and invigorated on longer journeys. Allies and Enemies: Byron and the Bashers have resolved numerous thefts and disappearances in the community. This has won them the almost undying support of both local independent merchants, and regional merchant guilds. There have been some instances of friction between the Bashers and local guards over the "appropriate" way to handle problems, and frequency of these flare ups seem to have increased as of late. 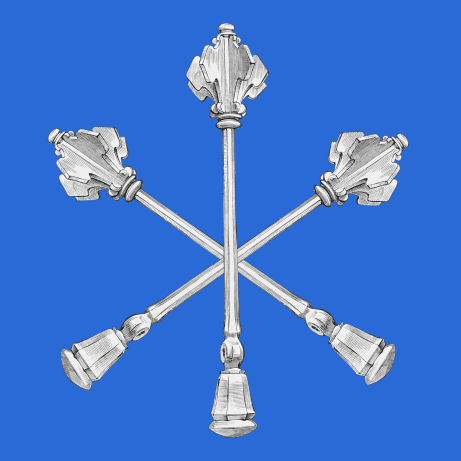 All Thieves, Assassins, Bandits and other unsavory organizations within 50 miles of the Bashers home hate nothing more than to see a person wearing a blue sash. Status Quo: There is talk that Byron Smith is going to retire, leaving his son William in charge. While most see this as a seamless transition, the Captains worry that William can be too ambitious, too lazy, and too loose with his money to continue his father's legacy. Also, since William does not share his father's love for generosity or the church, certain ties might be strained. o Byron Smith has taken ill (or died), leaving daily operations in the hands of his son William. William has a number of outstanding gambling debts with the sons of many of the local merchant's which is greatly straining some relationships. Additionally, almost every task taken on by SPS under William's command so far has met with disaster. · A shipment of rare fruit from the southlands to the leader of the merchants guild was apparently poisoned. The man nearly died, and blames William for the misfortune. · William met with a merchant to discuss business when they were attacked by the local thieves' guild. The merchant in question had no known enemies and it appears several of the thieves were targeting William. The merchant has since kept her distance, causing a valuable contract to be lost. · During the night a shipment of spices was stolen from a merchant's warehouse. Local authorities cannot find a motive or evidence of a break in. Three SPS guards were on duty the night of the incident but they report no strange activity and claim to have been at their posts all night. · A caravan headed north under the Basher's protection disappeared right after Byron fell ill. The body of one of its merchant recently turned up with a strange symbol scrawled on his chest. o (Fighter campaign) A call for recruits has been issued by SPS for an expansion to the Eastern Frontier. SPS will equip and provide provisions for the journey. Any treasure found while there is the party's, with a small percentage going back to SPS. o (Mixed party) SPS needs adventurers to track down and locate three rogue guards who assisted a local thieves' guild with a recent heist. The bounty is for the return of the guards (alive) and the stolen property. Please see Jesse Meltzer for details.